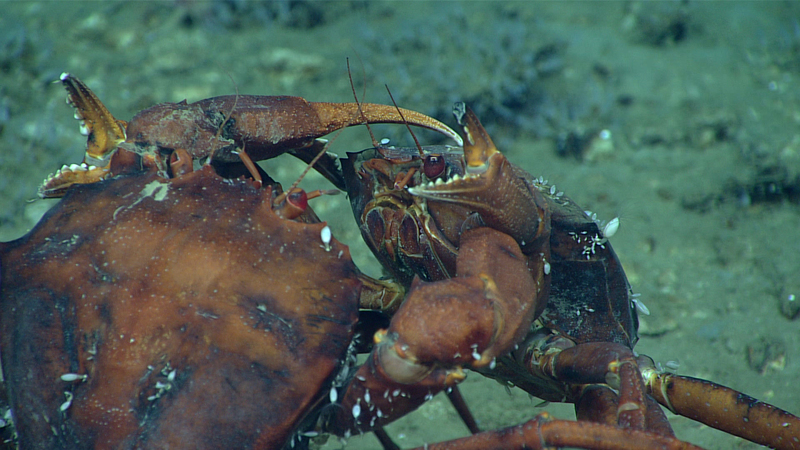 Two deep-sea male red crabs, Chaceon quinquedens, go claw-to-claw in an apparent duel for the affections of a nearby female. At least, that’s how we interpreted their behavior. Image courtesy of the NOAA Office of Ocean Exploration and Research, Gulf of Mexico 2017. Download larger version (jpg, 895 KB). Squat lobsters take shelter among a dense cluster of Desmophyllum sp. cup corals and a white Anthothela sp. octocoral growing on the mostly dead skeleton of the stony coral Madrepora oculata. Live colonies of Madrepora oculata can be seen at right and in the background. Image courtesy of the NOAA Office of Ocean Exploration and Research, Gulf of Mexico 2017. Download larger version (jpg, 1.3 MB). Video of liquid asphalt seeping from the seafloor. Seen while exploring a site dubbed “Henderson Ridge Mid South,” at a depth of ~1,260 meters (4,134 feet). Video courtesy of the NOAA Office of Ocean Exploration and Research, 2016 Hohonu Moana. Download larger version (mp4, 25.9 MB). Dive 09 took place on the northern side of a ridge feature at a site dubbed “Henderson Ridge Mid-South,” starting at a depth of 1,260 meters (4,134 feet). During the dive, we explored five possible locations of methane bubble plumes identified during multibeam surveys by NOAA Ship Okeanos Explorer. Progressing through the approximate bubble-stream locations, we observed evidence of chemosynthetic activity at some of the locations, including reduced sediments, bacterial mats, and the shells of dead chemosynthetic mussels. 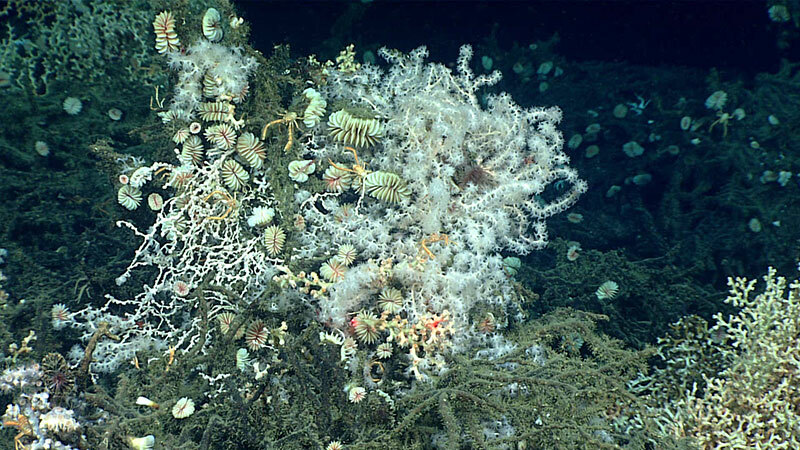 Towards the second half of the dive, incredible deep-sea coral communities appeared, with large colonies of Paramuricea sp., Madrepora oculata, Clavularia rudis, and Enallopsammia sp., many of which hosted diverse communities of commensal invertebrates. Nearly all of the coral communities were confined to asphalt extrusions and carbonate outcrops, indicating how important hard substrates are for increasing the diversity of seafloor communities in predominantly sedimented areas. During the dive, we also observed an area of liquid asphalt seepage with a small community of tubeworms (Lamellibrachia sp. ), as well as a previously unknown methane bubble stream that hosted a chemosynthetic community of bacterial mats, mussels (Bathymodiolus spp. ), shrimp, eelpout fish, and a variety of other organisms.